Suncreek Villas has entrances on both Hedgecoxe & Alma. From Alma, turn West into Suncreek Villas (Pacific Dr) Turn left at Chestnut Hill Dr, right onto Georgetown Dr, home is on the right. From Hedgecoxe, turn North into Suncreek Villas (Vashon Dr) at end, turn left onto Georgetown Dr.
Hello, I’m interested in 1618 Georgetown Drive and would like to take a look around. The details on 1618 Georgetown Drive: This townhouse located in Suncreek, Allen, TX 75013 is currently for sale for $275,000. 1618 Georgetown Drive is a 1,850 square foot townhouse with 3 beds and 2.5 baths that has been on Estately for 8 days. 1618 Georgetown Drive is in the Suncreek neighborhood of Allen and has a WalkScore® of 44, making it car-dependent. 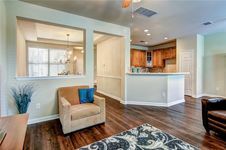 This townhouse is in the attendance area of Beverly Elementary School, Hendrick Middle School, Clark High School, and Plano Senior High School.